The folks at Marmol Radziner Prefab have been busy bees these past few months. Aside from their two new Joshua Tree homes, a slew of other custom projects, and Leo Marmol’s lecture and interview at the Dwell on Design conference, the dynamic duo have just completed the initial installation of their Utah House 1. Two days before Thanksgiving Day, the fifteen-module custom home was assembled on site, near Moab, Utah. Before the owners move in after the New Year, all that’s left to do is connect utility lines and seal joints between the modules. Prefabricated in Marmol Radziner’s own state-of-the-art factory, Utah House 1 arrived on site with pre-installed solar panels, windows, doors, and cabinetry. We’ve touted the work of Leo Marmol and Ron Radziner in the past, and we applaud them for their streamlined, in-house prefab processes and commitment to integrating new and cutting-edge green technologies. Hear their thoughts on prefab, sustainable architecture, and the future of Marmol Radziner in out our recent interview with Leo Marmol here. First of all, make the distinction between panelized and modular. There's an enormous difference and it makes no sense comparing apples to oranges. Modular involves nominally complete sections of the house being joined on a foundation, and panelized is a "kit-of-parts" that involves a lot more on-site contracting work. There are advantages and disadvantages to each. For those that don't like MRP's modular approach, panelized construction can be cheaper if you assemble it yourself (sometimes), and is more hospitable to a sloped roof. The reason the majority of _modular_ houses have flat roofs is that they are the size and shape of the allowable shipping envelope on highways. There have been experiments with shipping a roof frame assembly to be constructed on site, but then your "complete" house gets delivered without a roof... you see the problem. As far as aesthetics go, I don't like the appearance of this either, although I completely applaud their efforts at environmentally conscious design. I suppose a lot of prefabs look very similar because they all adopt a single-storey long rectangular form. When you add the obligatory "indoor/outdoor living" feature (which is only really suitable in a non-urban environment), what you usually get is a bit of decking and floor-to-ceiling glass windows or sliding doors. How much variation can you have with a singe-storey rectangular form, some decking, and floor-to-ceiling windows? Well, not much it would seem from the prefab examples that have been posted so far! Or am I being too cynical?! How sustainable is a giant prefab in the middle of nowhere? Also, I agree with the first comment about aesthetics. Why are so many of the "sustainable pre-fabs" ugly modernist boxes? True enough, the eye of the beholder it is. I'll second Aristotle on this home - simplly stunning. Marmol Radziner and now MKD are operating their own factories to produce homes - something once thought to have been the kiss of death that sank the previous prefab efforts of days gone (think Lustron). I guess we'll see. Again, really a graceful and well done design. Funny, about the eye of the beholder... I think it's stunningly beautiful. Green that may be, and spiffily modular, but that is one ugly son of a house. Is every prefab architect against chair rails and angled roofs? The folks at Marmol Radziner Prefab have been busy bees these past few months. Aside from their two new Joshua Tree homes, a slew of other custom projects, and Leo Marmol's lecture and interview at the Dwell on Design conference, the dynamic duo have just completed the initial installation of their Utah House 1. Two days before Thanksgiving Day, the fifteen-module custom home was assembled on site, near Moab, Utah. Before the owners move in after the New Year, all that's left to do is connect utility lines and seal joints between the modules. 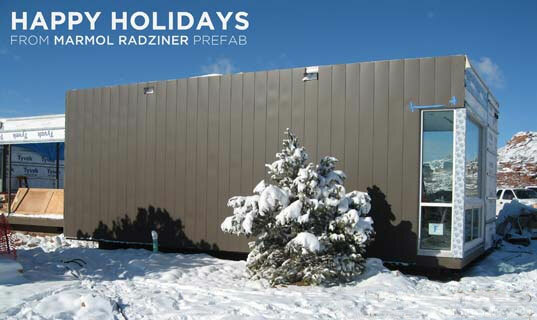 Prefabricated in Marmol Radziner's own state-of-the-art factory, Utah House 1 arrived on site with pre-installed solar panels, windows, doors, and cabinetry.